X-Factor takes the X-Patriots out on the town. Tensions remain high between X-Factor and the X-Patriots, moreso when Jenny Ransome & Philip Moreau arrive. Inside the X-Patriots' ship, Rahne meets a young mutant named Taylor who uses his cold fire power to sculpt, while Val admonishes Havok for agreeing to accompany the X-Patriots back to Genosha. They are drawn outside by a commotion to find Cameron Hodge attacking everyone. 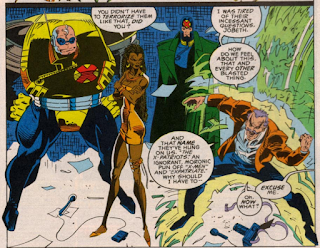 But Hodge is actually Lukas, lashing out, and Havok shuts him down, before deciding the X-Patriots need to blow off some steam and offering X-Factor as guides to help them explore the city. Elsewhere, Rick Chalker completes an operation to replace his hands with razor sharp fan blades, but when he discovers he's left himself no way to leave his lab, he slaps his forehead in disgust, accidentally killing himself. Back in New York, Havok & Polaris accompany Prodigal to the Statute of Liberty, Strong Guy takes Pirouette dancing and Quicksilver & Lukas con a belligerent drunk at a bar. Meanwhile, Rahne takes Taylor to an art museum, but he wanders off when Rahne starts arguing with Madrox. Outside the museum, Taylor uses his power, drawing the attention of a group worried he's going to burn down the park. They attack and beat him before running off. 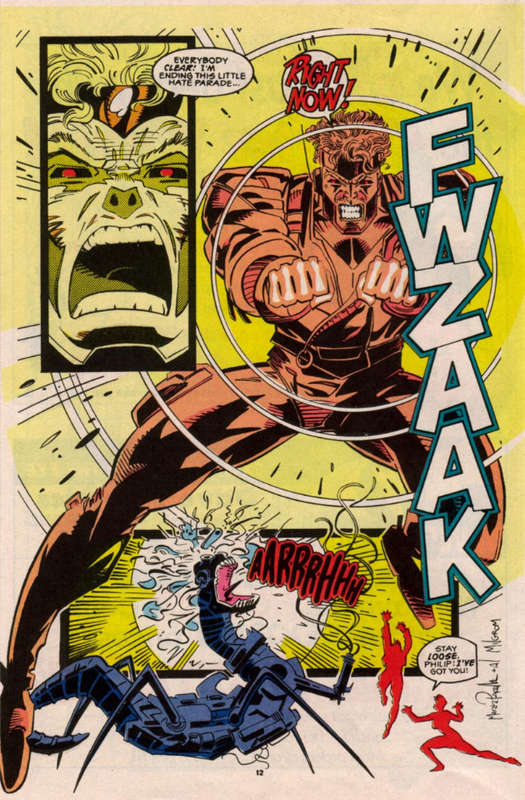 As Madrox attempts to chase them down and call for help, a distraught Rahne tries to help the unconscious Taylor. Rick Chalker, brother of scientist Vic Chalker (who died in issue #77 when it rained on his mutant-killing battlesuit) makes his first appearance in this issue, determined to avenge his brother and calling himself Number One Fan, then almost immediately dies, after slapping himself in the forehead for failing to install a doorknob he could use with the razor sharp fan blades with which he replaced his hands. 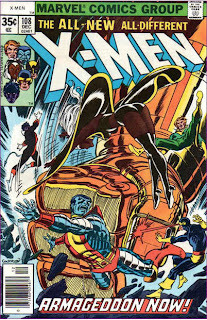 Jenny Ransome & Phillip Moreau, central characters of the original Genosha story and "X-Tinction Agenda", pop up in this issue to help facilitate the X-Patriots situation, and argue on behalf of the notion that Genosha is different now. Mark Pacella, still inexplicably finding work around the X-office, fills in on this issue. 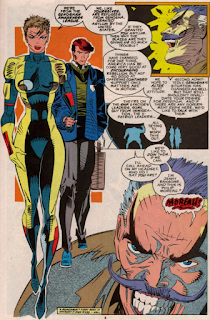 Walking amongst a group of Genosha Mutates, Rahne reminds us that if she were to return to her full human form, she too would be a Mutate, and just as docile as they. 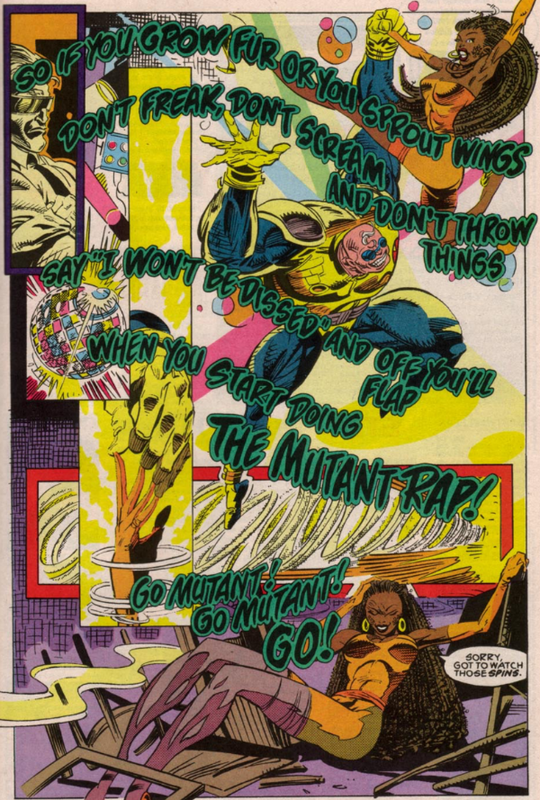 Strong Guy reveals he rigged the doorknob of X-Factor's Danger Room to fall off, a reference to issue #78. Strong Guy takes Pirouette dancing at a club that is playing "Mutant Rap", a pretty clear parody of Vanilla Ice's "Ninja Rap" from Teenage Mutants Ninja Turtles II: Secret of the Ooze. 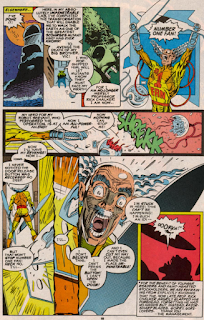 For some reason, Pacella and inker Al Milgrom rather noticeably sign one of the issue's several splash pages. Were they thinking there'd be a huge aftermarket demand for original art featuring an awkwardly posed Havok making a pooping face, and wanted to make sure everyone knew who was responsible for it? 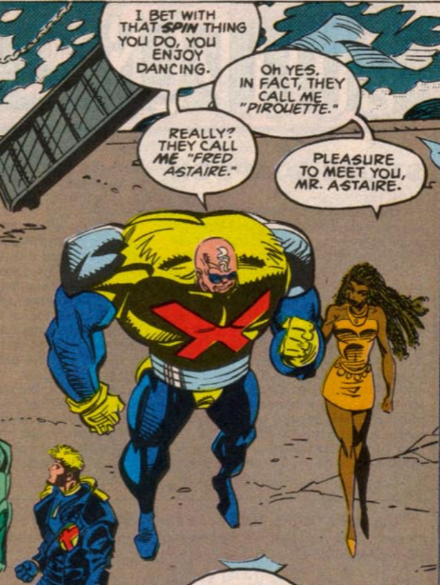 Between panels, Strong Guy shifts from wearing his regular X-Factor uniform to wearing the "X" shirt he wore in issue #81 (or, at least, the large X gets drawns onto his uniform jacket). Lukas rails against the X-Patriots moniker applied by the media, criticizing it for being a pun on the X-Men and expatriates, which is probably also Peter David lampshading the whole thing. 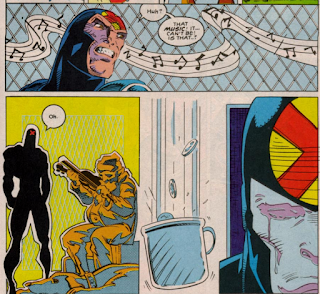 While babysitting some of the younger X-Patriots, Madrox hears music and rushes to its source, believing it to be Rhapsody, but is saddened to find that it's not. With his poor Rob Liefeld impersonation no longer needed over on X-Force, Mark Pacella shows up here to crap things up for X-Factor with his dead white eyes and awkward poses for an issue. Thankfully, Peter David remains on point, continuing to wring some fun characterization from a plot that's kind of a dud. The X-Patriots aren't yet terribly compelling characters in their own right (and never really will be), but their interactions with the various members of X-Factor are at least entertaining, chiefly Quicksilver and Lukas bonding over being the respective assholes of their groups, then going out and being straight-up dicks to a guy in a bar. David has been fairly vocal about his upcoming departure from the series being motivated by his frustration with the way "X-Cutioner's Song" interrupted this ongoing story, and on the one hand, I can certainly see his point: this issue does end more or less on a cliffhanger, with a grief-stricken Rahne standing over the body of a dead or dying X-Patriot attacked by an angry mob, but the whole plotline will be shunted into the realm of subplot (at best) over the series' next three issues. 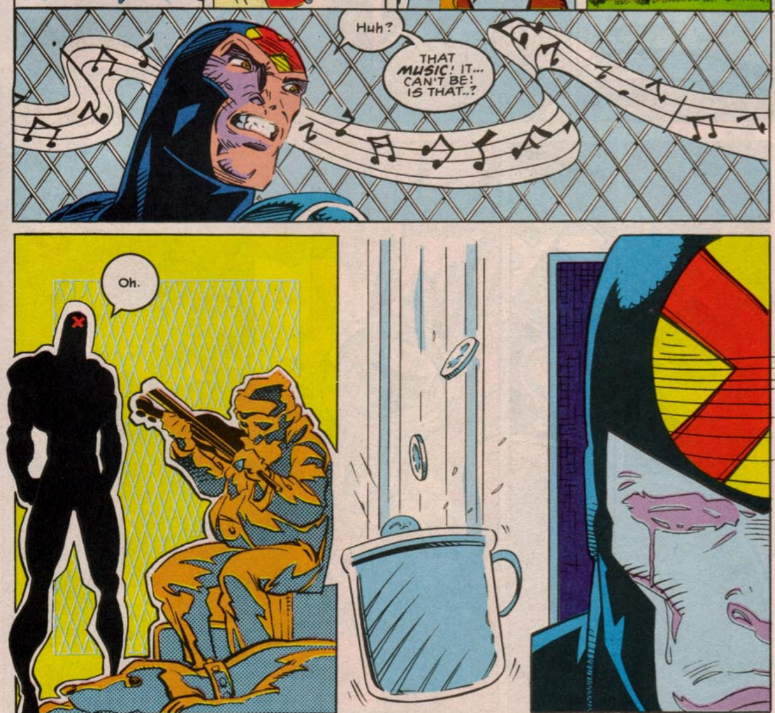 But on the other hand, I have a hard time imagining "X-Cutioner's Song" snuck up on David, that he didn't know the next issue after this one would be the second chapter of an unrelated storyline when he wrote this ending. I think I'd probably also be more sympathetic to his perspective if the X-Patriots storyline, as a whole, ultimately worked better than it does. Then again, maybe it would work better if it didn't have three issues of another story shoved into the middle of it, so perhaps David has a point. Next week: X-Men #13, Excalibur #55 and Wolverine #62. 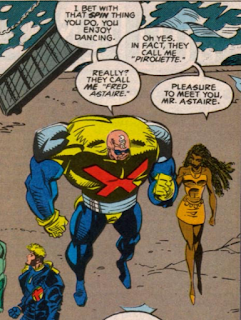 As someone who wasn't reading X-Factor at the time, I didn't love the X-Patriots and their awful costume design taking up space in that X-Cutioner's Song. As a 10 year old, I just wanted to watch Wolverine, Cable and Bishop f-ing fight. (Frankly I probably still enjoy that more even as a 34 year old). "With his poor Rob Liefeld impersonation no longer needed over on X-Force, Mark Pacella shows up here to crap things up for X-Factor with his dead white eyes and awkward poses for an issue." Parcella's art is still awful, but seems clearly non-Liefeldian in style this time. Does it means that he was told to imitate Liefeld when he draw X-Force? Veteran Milgrom certainly had towork a lot in order to make Pacella's art seem more palatable here. Pacella’s work — and I’m quite impressed you didn’t knock Milgrom too, dubious signature aside, maybe because he inked Capullo sympathetically on X-Force #15 “yesterday” — is so dire that Rick Chalker isn’t my least favorite thing about the issue. Not giving the Genoshans civilian clothes was kind-of dumb. Heck, X-Factor should’ve been in them as well, after Val rightly charged Alex with being as unobtrusive as possible in taking superpowered mutant refugees lacking visas out in New York City. Quicksilver’s magnanimity felt rather out of character until the end there, I’ll give David that — not that it wouldn’t have been a smart move, on its face, but Pietro doesn’t have it in him to throw a contest like that. I never got why the one X-Patriot was "from Glasgow." Wouldn't he be "from Genosha"? If they're mutates, they are from the era when the country was exploiting its native mutant population. They weren't kidnapping mutants out of other countries, unless they were native Genoshans who had emigrated, like Jenny Ransome. That bugged me as a kid. 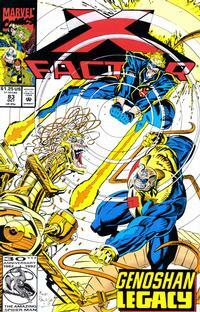 This issue was the first PAD X-Factor issue to really severely disappoint. 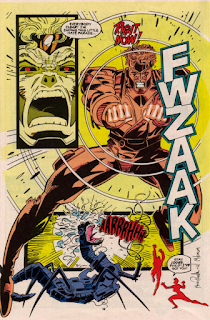 One plausible scenario is that his Genoshan parents emigrated to Scotland when he was a little kid or before his birth, but maybe there were family members left to Genosha who tested positive for mutants and the Press Gang (who exists for the very purpose) were sent to check him out too at his teens. 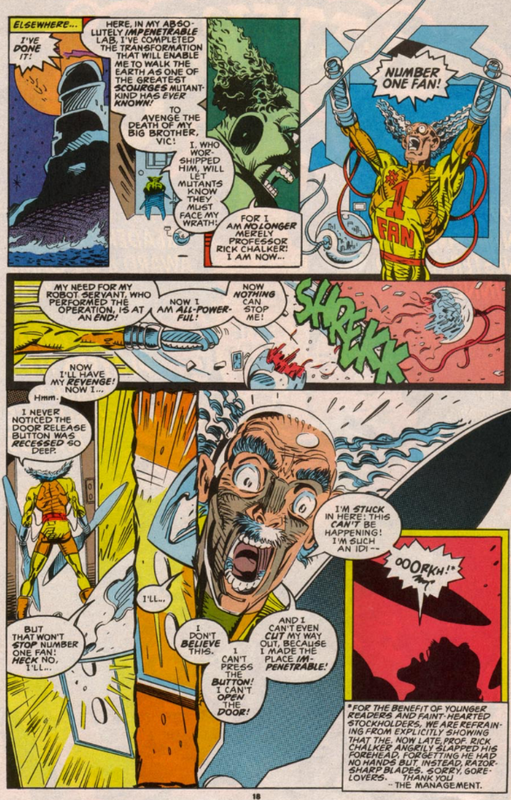 As Pipeline puts it in UXM #235 to Jenny Ransome, "Genosha acknowledges no other citizenship but its own. Whatever you claim, Genoshan by birth means Genoshan for life." The original Genosha story started with the scene of a mutant dad trying to send his baby to safety. It's (been) a credibility issue to the Genoshan government that the mutantkind can't escape their responsibilities like that. I wonder how long Genosha had had those policies up? In original Claremont intentions, that is, not any of that Sugarman crap. The bigger question re: Genosha is when its economy, dependent upon mutate slavery, was established and just where Doctor Phillip Moreau procured a strain of the Transmode Virus from to develop his TRANSMODation process! ?